Everything that you've heard is true -- the PDF format has taken over the universe, and sooner or later you're going to come across a PDF document that needs editing. The only problem? You're used to flexing your editing muscle in word processing programs like Microsoft Word, and the PDF format was never intended to be messed with in the way that you want to mess with it. Well, along comes Infix PDF Editor to return order to your chaotic editing lifestyle! 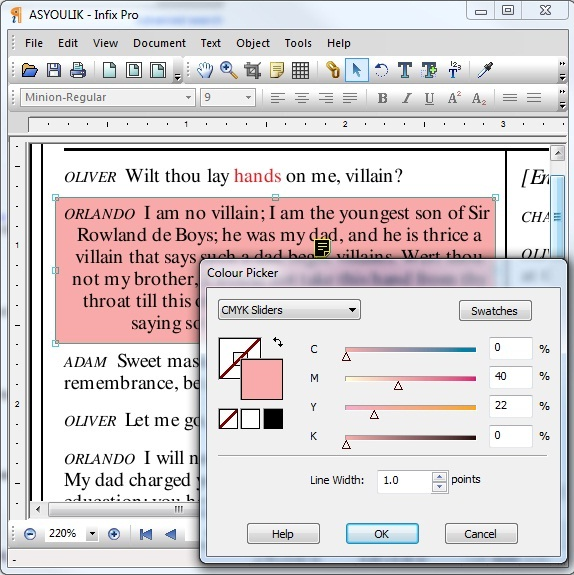 With Infix PDF Editor, you have access to all of the powerful text and graphic editing powers that you've grown accustomed to wielding with abandon! You can make changes to the text of a PDF document, and even copy and past graphics, text, and artwork between PDF files. There's even search and replace functionality to soothe your itchy Ctrl-F and Ctrl-H fingers! Font size and color changes? Yes. Left, right, and full justification? Yes. Infix PDF Editor doesn't just do text editing, either -- you can adjust layout parameters and use tabs, margin settings, and indent controls just like you've always done with your favorite word processor! There's even spellcheck in more than twenty, count 'em, TWENTY different languages! 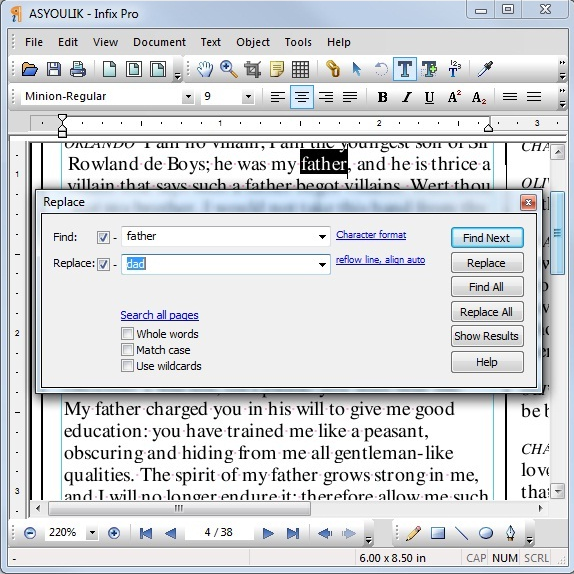 Utilize familiar word processing functionality to edit your PDF documents! Perform spellcheck in more than twenty languages! Copy and paste text, graphics, and artwork between PDF documents. Perform search and replace across files! After you purchase Infix PDF Editor it may be used indefinitely. Infix PDF Editor is licensed per user, so if more people are going to use Infix PDF Editor you will need to purchase additional copies. MB Do you sell in this offer version 6? Simon Crowfoot Yes this offer does apply to version 6.
calu bulbucan Is this the Pro version (according to the price)? Simon Crowfoot Yes it is the Pro version. Peter de Vries I own Acrobat Pro and regularly have to create and edit PDF files generated from a bunch of extensive and complex MS Office documents, for tender and certification projects. Never heard of Infix Pro even sometimes I google for PDF editors with additional functionality (that Acrobat does not offer). Thanks to BitsDuJour I've discovered Infix Pro today. Downloaded the trial version and only needed a few minutes to decide this programme is well worth the money. First, the user interface is very easy, did not need the manual for a try-out. Then I was amazed how easy is it to edit content. You can edit text even if the fonts are not installed on your PC. Can't do that with Acrobat. You can duplicate shapes to a range of other pages, Acrobat can only duplicate buttons. It can list all colors used (in a clear way! ), it can show multiple panels (for layers, bookmarks, etc.) on the left where Acrobat can only show one. It has all kind of functions to search explore and edit fonts, text and shapes. Did not need more than a few minutes to check the trial version, because I know sometimes just 1 or 2 of these unique functionalities can save hours of rework. Repeatedly. I can only imagine this application is made by people who were heavy PDF users themselves. the list price on your site says 129 euro + VAT, while the price offered in this deal is 188,53 euro incl. VAT (before the discount). Does this mean that a VAT rate of 46% is applied? Sounds rather hefty if you ask me. If I am VAT registered within EU, do I still have to pay the VAT? Simon Crowfoot The commerce system that BitsDuJour is using for this offer only prices in US dollars. Our site has separate pricing for dollars, euros and pounds. The BitsduJour euro price is generated using the exchange rate at that point in time. I suspect this is why you are seeing a discrepancy. If you are VAT registered within the EU you will not have to pay VAT. Constantin Florea @Peter R, I have also contacted the vendor mentioning your comment. So far I didn't receive any returned message back. Simon Crowfoot Sorry for any confusion caused. Our site www.iceni.com went offline for a brief time about midday yesterday until this morning. It is back online now. John Brazier I've been looking at www.iceni.com - where I see that Infix is now at V7 - but there's no mention of Pro. Have they been merged in V7? Simon Crowfoot Yes, Infix version 7 is the equivalent of Pro. JW I stopped using Infix Pro a year ago when you converted v7 to an annual Subscription model which I didn't consider as good value for money. Have you now reverted to allowing people to purchase a 'proper License' again? And if so, are you offering any reduction on updating/Upgrading my license from v6 to v7? The cost of moving from Infix 6 to 7 is roughly the same as the old version 6 upgrade. Marshall Brown I need to create forms with basic calculation, addition, subtraction, multiplication and division. I down loaded the User Guide but did not see any reference to creating forms, (I didn't read the whole thing). Is this something this product does? Simon Crowfoot Infix 7 can create forms. However there is no scripting ability which means the forms could not perform any calculations. Urb User What happens after 12 months, do I have to pay again and how much will that be? Simon Crowfoot After 12 months Infix will still work but support, upgrades and free use of TransPDF will stop. To continue to receive support, upgrades and free use of TransPDF another license will need to be purchased. Ian User The licence text indicates it is a 1 year licence which will not work after 1 year, but comments above seem to say otherwise. Can you clarify. After 12 months Infix will still work but support, upgrades and free use of TransPDF will stop. To continue to receive support, upgrades and free use of TransPDF another license will need to be purchased. Ian User You should be aware that Chrome is blocking trial downloads. John H Does TransPDF translate Chinese? Yes, TransPDF can be used to translate Chinese PDFs to a PDF in another language or vice versa. Get Dynamic. Get Efficient. Get Productive. 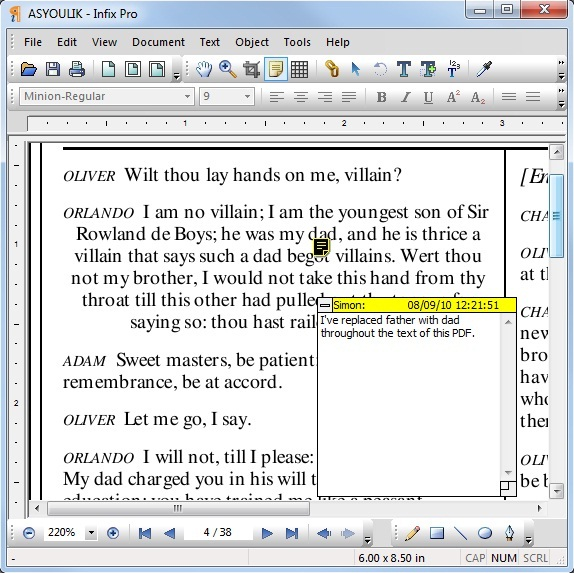 Get PDF-XChange Editor.